The New Kingdom of ancient Egypt started in 1550 B.C.E when the nation’s capital moved to Thebes. During this time, the Egyptians also created the famous underground burial site called the Valley of the Kings. In this valley, tombs surrounded by pyramids held many kinds of treasures. Some tombs even contained food, royal clothing, gilded furniture, jewelery, weapons and chariots, which were all buried with the kings, or pharaohs, to be used during their afterlife. Because pyramids were easy targets due to their size, however, many of the treasures buried with pharaohs were stolen. Tomb robberies ultimately led the Egyptians to bury their pharaohs in secret underground tombs, hidden away in cliffs to the west of Thebes. The Egyptians believed that the kings buried here were on an after-life journey to meet the sun god, Ra. These secret underground tombs were guarded by specially designed traps and a police force, so thieves would not be able to steal the pharaohs' treasures. Pharaoh Seti I, for example, had the most extravagant tomb in the Valley of the Kings. Its treasures were protected by hidden shafts and stairs. Another valuable treasure in the Valley of the Kings was the mask of the famous pharaoh Tutankhamun, which was made of solid gold and precious blue stone. This mask represented the pharaoh in the image of sun god Ra. 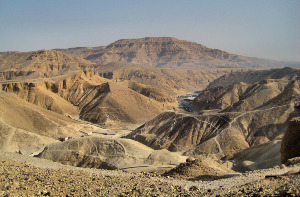 There were other burial sites close to Thebes as well, including the Valley of the Queens and the Valley of the Nobles. Thanks to police forces and the hidden tombs, some of these treasures remained unspoiled and give archaeologists a look into the lives of the kings in ancient Egypt.